Michael J. 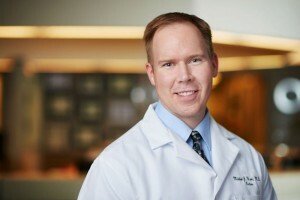 Ward, MD, is a board-certified, fellowship-trained retina surgeon specializing in the full range of vitreoretinal diseases including macular degeneration, diabetic retinopathy, retinal tears and detachment, ocular trauma and infections, and retina surgery for macular hole and epiretinal membrane. He utilizes state-of-the-art diagnostic equipment such as digital fundus imaging, fluorescein and ICG angiography, fundus autofluorescence, ocular ultrasound, and optical coherence tomography. While at Jefferson Medical College, Dr. Ward was awarded the Thomas D. Duane, MD, PhD Fellowship at Wills Eye Hospital where he conducted research and published on eye trauma. During his ophthalmology residency, Dr. Ward’s research on sutureless, minimally invasive retinal surgery was presented at national and international meetings. He went on to complete a prestigious 2-year fellowship in vitreoretinal diseases and surgery at the esteemed Scheie Eye Institute at the University of Pennsylvania, where he participated in the first gene therapy trial in the United States for hereditary retinal disease. Dr. Ward continues to be active in various clinical trials which contribute to the future of vitreoretinal care.